Sometimes, in workshops or talks to writing groups, I remind people that you don’t ‘write a novel’, you write some words, then some more words, then some more – and eventually there’s a substantial pile of paper on the desk and you realise you actually have written something that’s a lot longer than a short story. I then add that, although that makes it sound easy and unstructured, it’s not, and I have great respect for the form and conventions of novel-writing. But it was a realisation that dawned on me as I was writing my first novel, which, after several years and many rewrites, became The Sparrow Conundrum. It’s also a reminder of the different people we have to be when we’re writing novels of any sort. Before starting the book, I’d written lots of stage and radio plays which were produced and broadcast and a few short stories, but it never occurred to me that I might be a novelist until I read about a competition and decided to enter. I should point out that it now feels as if that happened around the time of the dissolution of the monasteries – no blogs, no Twitter or Facebook – just a biro, a notebook, an old portable Remington, lots of Tippex and that horrible carbon paper. I didn’t win the competition but I sent it to an agent and he took me on. In the end, he didn’t manage to sell it, but the important thing was that it had shown me I could sustain and control an extended narrative, so I started writing the next one, which was an early version of The Darkness and which led me to another agent and my first published novel, Material Evidence. 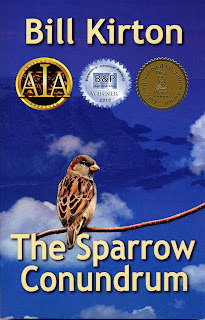 Needless to say, The Sparrow Conundrum, while essentially the same story, has evolved through rewrites, changes of setting and personnel, updating and other processes. But mostly, the experience of eventually seeing it in print and ebook form confirmed what I’d always believed – that ideas, words, even apparently unwanted stories can be successfully recycled. The Darkness is another example. As I said, it was the second novel I wrote but, after many, many rewrites and changes of title, personnel, themes and a final significant shift in its moral stance, it eventually seemed ready for publication. And both have been well reviewed and won awards. ‘Recycling’ doesn’t just mean doggedly sending a book off to agents and/or publishers until one of them surrenders; it suggests a deliberate separation of the creative functions of writer, editor and critic. And that separation is even more critical now that it's become so much easier to publish our books. We all know that a good editor can bring to a book insights that never occurred to the writer but, with the power and influence of those excellent people waning significantly nowadays (at least in the publishing houses), we need to make sure that we don’t lose the qualities they helped to nurture. By all means write the first draft in a flurry of creativity and carelessness, but then step back, assess it critically and be your own worst enemy in judging pace, characterisation and the rest. The Sparrow Conundrum started as a spoof spy story, Glasnost forced a rethink on its market potential, so it moved to a spoof crime story with North Sea oil at its centre. Then North Sea exploration techniques changed so more adjustments were needed. And so it went on, changing location several times and titles even more. The interesting thing, though, was that the absurdities of which the central characters were capable remained relatively constant. So whether your ideas file is full of notes on the adventures of Zarg the Enforcer in the Epsilon Galaxy, Vampiric recipe books, or Miss Marple’s great granddaughter’s detective agency in downtown Auchterarder (OK, she was a spinster but you never know), don’t throw them away. Some judicious critical appraisal and subsequent editing could make them intensely topical. Incidentally, herr kirton, I read the Sparrow and parts of it nearly crippled me laughing. thank you. i will do a kindle review, i promise, but at the moment i'm too busy to think. got my own ae post due in a week and it's brung me out in spots. did you ever read jack trevor story's 'the wind in the snottygobble tree'? i think you'd like to. recycling, you know it makes sense! Good points well made, Bill. my new crime novel The Operator began life as an idea for a first one - many many stages of evolution and lying fallow periods went into it. Thanks Jan and Lydia. I shall buy snotty gobble forthwith and I already have The Operator on my TBR list. OMG - I looked up The Wind in the Snottygobble Tree on Amazon and you can only get used copies. Prices start from £29.99. Better start counting your pennies, Bill, and start racking up Kindle sales! Yes, I noticed that, too, Chris. I have a wee note on my desk reminding me to look for it in the library on my next visit. My respect for Jan's opinions knows no bounds, except maybe the thirty quid contour.